The South Canadian Amateur Radio Society is an American Radio Relay League (ARRL) Special Services Club. We serve the amateur radio operators in the Cleveland County, Oklahoma area. The club has been operating since the fall of 1977 and works hard to grow and support the amateur radio operators in the local area. We also work to help develop the amateur radio community in the region, state and beyond with our Facebook presence and weekly newsletter. We have also documented the past by collecting, scanning, and displaying the 28 years worth of Central Oklahoma amateur radio newsletters in our CORA Collector and Emitter display gallery. The amateur radio community is strong, and growing, both at the national level and here at SCARS. We are a group of people who are interested in communicating without accessing the public infrastructure. SCARS members are interested in talking to our friends or family during severe weather conditions, or when power or communications systems are down. Hams are typically ‘makers,’ and are interested in building our radio communications equipment. Amateur radio provides many different project opportunities to design, create, and use our gear. Therefore, we live at the intersection of computers, the Internet, and radio. New, inexpensive devices allow us to communicate with neighbors using low power VHF or UHF systems. We can talk around the globe using the linked Digital Mobile Radio (DMR), or D-STAR technologies, or through space, with satellite links in a matter of minutes. Welcome to the world of Cleveland County amateur radio, come in, take a look, listen, or join us for your next, or first, adventure. Yes, it’s picnic time again. And, this year it looks like great weather for this Saturday’s picnic at the Denny WA6DKD and Otie N7TVJ radio ranch. The official starting time is about 4:00 pm, April 27th. Phil Sinnett KD5UGO will be getting the food ready between 5:00 pm and 6:00 pm. However, Denny said anytime after noon is OK. The address is 9400 Banner Rd, just east of 84th street. You’ll turn south right after the bridge. This is a semi-annual event and it’s always a great time to meet and greet your fellow SCARS folks. No RSVP is required. The club will provide burgers, hot dogs, hot links and buns. We will have water, iced tea and lemonade available. PLEASE bring a side dish, or dessert to share with the group. Baked beans, salads of all kinds, cakes, cookies, or other items would be great. Feel free to bring any additional drinks, as required. Bring your radio projects. Bring your radio questions. If you’d like some help getting on the air, we’ll crank up Denny’s station and talk to the world… See you there! SCARS offers VE testing sessions on the first Thursday of the month at 6:30 pm at the Norman Firehouse #7, 2207 Goddard Ave, just west of the intersection of W. Rock Creek Rd. and N. Flood Ave. All of the location and time details are available on the license page of this website. Sign up here today! The City of Moore has just received a new emergency communications vehicle. This truck is outfitted as a mobile communications office for Emergency Management Director Gayland Kitch WX5MOR, and the city ops commanders. Gayland will talk about the vehicle and have it available on-site for a tour. SCARS meetings happen on the second Saturday of the month (third in June) at 9:00 am at the Norman Firehouse #7, 2207 Goddard Ave, just west of the intersection of W. Rock Creek Rd. and N. Flood Ave. All of the location and time details are available on the Meetings/Nets page of this website. SCARS offers Elmer Nights at the Norman Red Cross, 1205 Halley Dr, Norman, OK. We meet every Tuesday at 6:30 pm to talk about radio and learn more about radio. Currently, there’s no agenda. Bring your problems, and your creative thinking, and we will help you solve your issues. Elmers, bring your skills and prepare to share them with the group. Note: The June meeting is the third Saturday in June, to let our members attend Ham-Comm, in Dallas! Our own Lea Greenleaf W5HLG will talk about creating your own Go-Bag for emergency communications use. Lea has spent years working on and working with his Go-Bag through his police / EMT / military career. Lea presented this topic as a series on the Monday Night OK ARES DMR net. More information can be found on our Go-Bag page here at W5NOR, that Lea put together. 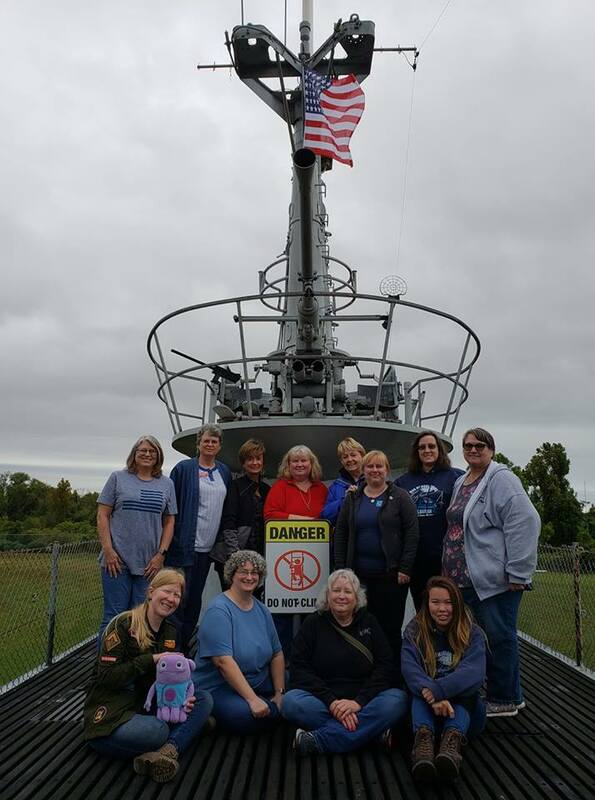 The YLs activated WW2SUB on the USS Batfish. Learn more about that (now annual) adventure on the SCARS Batfish page. Our first batch of 30 tape measure antennas sold out in minutes. Another batch is now available. These kits are only $10 and are available from Mark Kleine N5HZR. More information is available on the tape measure antenna page. Photos from Field Day 2018 are here. The Pixie 1/2 watt 40 meter CW kits have arrived. “Get ’em while they’re hot” for $10. To get started, take a look at the SCARS Pixie page for circuit descriptions and build instructions. Also, you can visit the refresher information on soldering, visit the SCARS soldering page. Our own Doug Forsyth WX5DF is managing the National Weather Museum & Science Center located at 1200B West Rock Creek Road, Norman, OK 73019. This facility houses the historical weather equipment that was either developed or used to promote the management of weather for the nation. Here you’ll find the world’s first Doppler radar console, a T-28 Trojan Weather Research airplane, a car that survived one of the Moore tornadoes, replicas of the largest hailstones, phased radar systems and a whole lot more. Current hours are Thursday and Friday from 10 am to 4 pm, and Saturday from 10 am to 5 pm. More information is available at http://NationalWeatherMuseum.com. Make plans to come, and see you there! We’re still working out the 2019 presentation schedule. We’d love to have some more great topics, and hopefully, you can supply those ideas. Contact Mark Kleine N5HZR, or post it on our Facebook group, if you have an idea for a future meeting. Are you ever out of town and want to tap into the local net back home but your 2-meter radio can’t reach that far? You can now take advantage of technology and the World Wide Web by listening to the SCARS and OU 2 meter repeaters online. Do what? Yes! It’s real, and it sounds great! Give it a try by clicking here. Just because the holiday season is over doesn’t mean your shopping comes to an end! You can still help SCARS raise money by shopping at Amazon. A percentage of the sales goes directly to SCARS general funds to help operate great events such as Field Day, radio nets and keeps the SCARS repeater equipment operational. Click here to help SCARS out. Our monthly meetings are streamed via YouTube Live, and are archived on the Internet. You can click on the image below and see the most recent meeting, or visit our YouTube channel to see previous events. Did you know that the SCARS uses a Cleveland County tower for the VHF and UHF antenna repeaters? Easy! Just program your radio to simplex and talk on 147.060 MHz and see how far you can talk to your fellow hams. You can also do this on 443.700 MHz. This is also a great time to test your ability to communicate in simplex mode during times of emergency if the repeater does fail. And did you know that you can also talk on our OU friend’s (Oklahoma Student Amateur Radio Club) repeater on 146.88 MHz (-600 kHz input; No tone) Give it a try!